Just found this one in my archives! 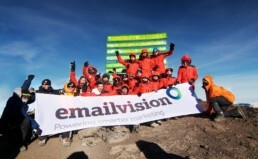 In October 2012, I was on the ‪‎Kilimanjaro‬ with Challenge Aventure / André Bernard for a team building event, with 20 persons at the summit! At the next base camp, our porters and guide offered us this small show! They sang me this song during the trek to learn me some ‪‎swahili‬ words! ‪‎hakunaMatata‬ ! !